A recruitment partnership between the Aboriginal Employment Strategy and Scentre Group is providing career pathways and employment for Indigenous job seekers. If you live in Australia it’s highly likely that at some point in your life you’ve walked through the doors of a Westfield shopping centre. Across the nation Westfield centres are economic and social focal points for their communities and have become major hubs of employment and training for local people. For the past four years the Aboriginal Employment Strategy (AES) has worked directly with Scentre Group (the group that owns, manages and develops Westfield shopping centres in Australia and New Zealand) to deliver a successful school-based traineeship program for Indigenous students. The program targets Year 11 and Year 12 students, providing them with opportunities to enter the workforce and pick up valuable skills and training whilst studying their HSC. Following the success of the program, Scentre Group is now in the process of coordinating a Reconciliation Action Plan (RAP) with a focus on improving employment opportunities for Indigenous people. This focus also involves continued collaboration with the AES and utilisation of their recruitment services. “The RAP came off the back of our success with the AES school-based trainee program, we recognised the need to have a greater involvement with Reconciliation in Australia and the RAP gives us a platform to be able to detail that and report on our progress,” explains Paul Stonebridge, Centre Manager at Westfield Penrith. Proposed actions for the Scentre Group RAP include support for Aboriginal culture in the workplace and a review on approaches to Indigenous recruitment. Scentre Group are planning to launch the RAP during NAIDOC Week in 2016. “Our focus is still on school-based trainees, however, we are also exploring full-time traineeships with the AES,” says Paul. Scentre Group manages 34 centres across Australia, with each centre offering career opportunities in fields including management, leasing, development, design and construction, marketing, facilities, security, human resources, IT and finance. 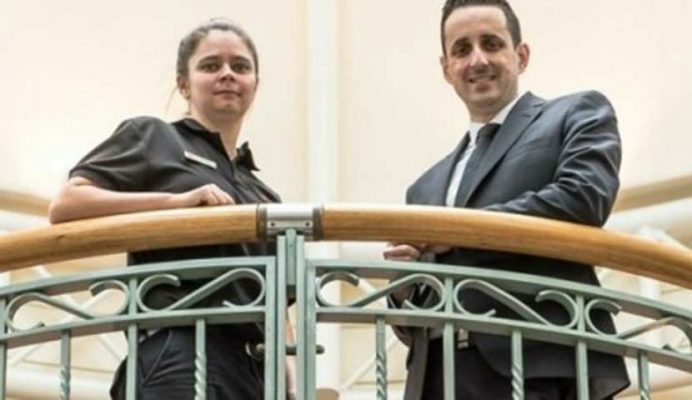 With such a broad range of career opportunities available, Scentre Group’s new focus on Indigenous recruitment stands to provide significant benefits for Indigenous job seekers and the broader community generally. Paul speaks enthusiastically about the positive outcomes for communities and the successful working relationship with the AES, whose recruiting services prepare, place and support Indigenous employees. “The AES play a vital role in recruiting and placing the right students in the right locations, they have also provided us with connections for Indigenous people looking for full-time roles,” says Paul. Currently employed as an electrician at Westfield Penrith, 23 year-old Tylissa Stephens is among Scentre Group’s current Indigenous employees. Tylissa’s role covers much more than just electrical and also involves maintenance, waste management, contractor management, emergency management and customer service. “I’m enjoying the work because every day is different, with different challenges, meeting new people, and also the cross over into other departments, I’ve learnt new skills across different trades,” says Tylissa. After completing her apprenticeship with Energy Australia and participating in the Women in Trades Program, Tylissa’s employment at Scentre Group was facilitated by the AES. Since joining Scentre Group in June 2015, Tylissa has also been involved in the development of Scentre Group’s RAP, providing some valuable insights into her life as an Indigenous woman working as a qualified tradesperson. Tylissa also acknowledges the support of the AES, among others, in progressing her career. “I did find it difficult as a woman working in trades when I first started, especially with the older tradies, some did not want to work with me,” she says.